The latest exhibition by C&G Partners, “Designing for Disaster” at the National Building Museum in Washington, has opened to the public. C&G Partners (New York) designed exhibits, graphics, media, interactives, and sound for the project. 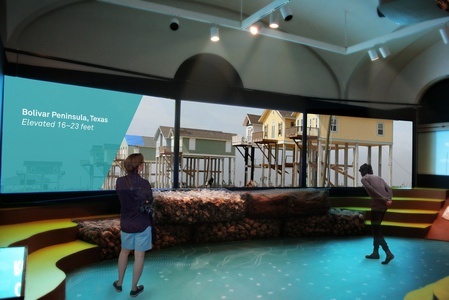 Through unique objects, captivating graphics, and multimedia—including video testimonials—the exhibition explores new solutions for, and historical responses to, a range of natural hazards, including earthquakes, tornadoes, hurricanes, storm surge, flooding, seal level rise, tsunamis, and wildfires. Visitors will be able to explore the tools available to help them evaluate and mitigate their own risks, and they will learn how they can contribute to disaster planning efforts in their own community. At the broadest level, the exhibition will promote the idea that we as individual citizens and as interest groups have an active role to play in protecting our communities, ourselves, and our property.